The process to remove wheel bearings from motorcycle rims is the same, in principle, across all bike manufacturers. The proper way to remove bearings from a rim is with either a blind bearing puller or a bearing removal tool. The blind bearing puller is expensive and not something a do-it-yourselfer would normally have on hand. or in the Summit Racing, Amazon.com and K & L Supply catalogs. A few Bearing Removal Kits on eBay. A few more on Amazon. Where are my Wheel Bearings? Before you attempt to remove the wheel bearings you must find them. Once you get the rims off the bike there are still some small pieces to remove. 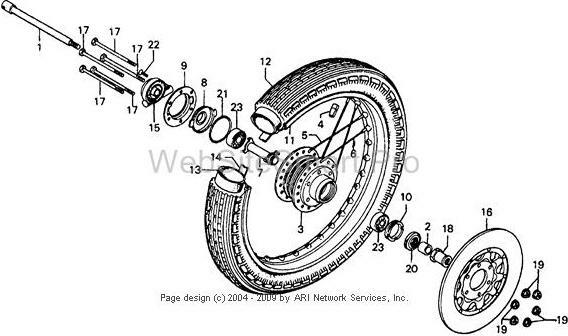 Below you will see schematics of the front and rear wheels on the 1976 Honda CB750F. The instructions reference the numbered items in the diagram. Remove the speedometer gear box, gear box cover and gear box retainer (15, 9 & 8). Turn the wheel over. With a flat screwdriver and a pick, pop out the o-ring (21), dust seal (20) and front wheel bearing retainer (10). Remove the rear wheel bearing retainer (7) and dust seal (31). Turn the rim over and take off the final drive flange(16) and remove the o ring (32). Obviously the easiest way to perform any task is with the proper tool. Insert the wheel bearing puller or removal tool, slotted side first, into the bearing. Lightly tap it with a small hammer or the tool handle until it bottoms out. Turn the wheel over and place it on the floor or a work bench. Make sure that the bearing tool is supported from underneath, a block of wood works. Drive a chisel or the handle supplied in the removal kit into the slot in the tool. Once it is firmly in there, remove the block of wood. If there is not enough clearance for the tool and bearing to exit the wheel, just an inch or two, raise the rim up until there is. You can use blocks of wood, a tire or a shallow bucket or drain pan. Next, strike the handle or chisel with a hammer, forcing the bearing and tool out of the rim. You may need to strike it more than once. Flip the wheel over and repeat the procedure on the other bearing. If you want to try it without purchasing the tool you can use a drift (like a tapered punch) or a curved chisel, with a vise grip, and hammer or mallet to drive the bearings out. Position the rim on a sturdy surface, like a heavy duty work bench. Trying to do this on the floor will be awkward, but it can be done if that's all you have to work with. Place the chisel through the center of the rim on the back edge of the lower bearing while bypassing the upper bearing. The bearings cannot be driven out together. You can not push the upper bearing into the lower one and through the rim. Clamp the vise grip on the chisel. Hold the vise grip, not the chisel or drift. Your non-smashed fingers will thank you. Take the time to position the chisel with care. Work your way around the bearing, using a moderate amount of force. Too light and it will take forever. Too hard and your rim could be damaged. Removing bearings this way can be very difficult. Take your time. Maybe get a friend or one of your kids to hold the rim steady. We recommend buying a wheel bearing removal kit. You should be able to get a decent one for under $50.